Brands are being discussed on social media every minute of every hour, each and every day. Whilst many are listening, some brands are still not properly tuned into what is being said and those that are active users, may not be interacting with their audience effectively using social media as a broadcast platform as opposed to a platform to engage. Twitter should be seen as a tool for life commentary. Users not only use it to share interesting information they find, but also to show ‘moments’ in their life. 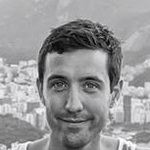 People share details about what they are eating, what they are doing and what they are witnessing be it out and about, sports events or television/film. They are effectively giving companies an insight into their daily habits and existence. It should be on these topics that companies look to connect with their customers. Real time interaction should be the focal point for companies between big campaigns and any self-promotion. For brands that use strategy purely as a broadcast platform, this strategy can limit the conversation had between the brand and customer as well as inhibiting the brand from interacting with any customer moments. If a customer tweets to a brand it is safe to assume that they expect or would like a response. By engaging with customers on complaints, product comments or general chitchat brands are able to build loyalty, loyalty that may lead to the creation of customer advocates, customer advocates who may promote the company to thousands of followers on Twitter. Listening in real time give brands insights into their customers as well as building bonds between the two. Brands need to be tuned into their customers sharing moments with them simultaneously. The most engaging brands on Twitter are able to react quickly to breaking news stories posting relevant and often humorous content. A great example of this was the reaction to the news of the royal baby which was announced on Twitter on 8th September. Nissan had pre-prepared an image celebrating the news and simultaneously advertising their X-trail vehicle. The tweet was released just 7 minutes after the announcement was made and was quickly followed up by companies such as M&S and Heathrow congratulating the family via Twitter and the @RoyalAlbertHall account suggesting that Albert would be a suitable name for the newest family member. #bendgate is another example that was massive on Twitter on 24th September with the hashtag used almost 90,000 times in reaction to news that the new iPhone 6 was bending in owners’ pockets. A whole host of companies leapt on the news releasing their own playful tweets promoting their own products. 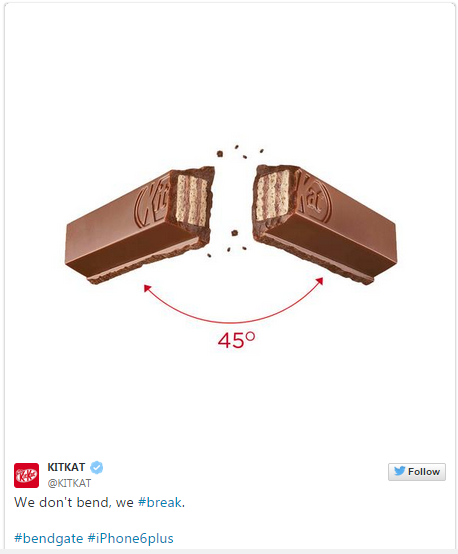 KitKat released a tweet just 30 minutes after the story broke (no pun intended) and the play on the brand’s “Have a break, have a KitKat slogan” helped the tweet amass over 25,000 retweets. 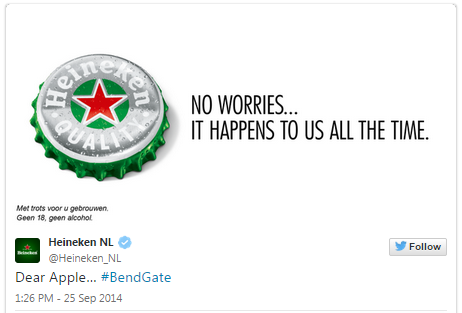 Heineken released a sympathetic tweet of their own on the same day featuring a bent bottle cap which managed over 10,000 retweets. Tweets like this can attract huge attention and can reach a massive audience if done properly. Light topical humour resonates well with social media users as well as the wider press. If brands are able to react quickly when it matters, this can be a real brand booster. Research suggests that in order to get the best click through rate (CTR), the best times to tweet are between noon and 14:00 and 17:00 - 18:00. Studies have shown that users are most likely to engage with tweets during these periods. The best days to engage with audiences are of course Saturday and Sunday. But whilst research suggests that these times are the best times to engage with customers, it seems logical that companies should adhere to their own time schedule based on the routines of their target audience. As mentioned, Twitter is a tool for life commentary depicting a series of moments, what we must remember is that users are not all the same and will therefore be living different moments. A health conscious fitness fanatic is likely to be using Twitter differently to a foodie or clubber. Companies need to recognise this and tailor their tweets accordingly. It is therefore vital that companies listen to keywords related their industry and analyse the frequency and time these words are most commonly used (TweetDeck is a great free application to do this). This information should in turn be used to shape their tweet strategy. Nike is an example of a company releasing tweets based on the activities of their audience. The Nike Running twitter feed not only responds to users giving advice on training regimes, it also times it tweets to coincide with the peak running hours offering motivation and advice whilst advertising products in the process. January 1st has become something of a benchmark day for the @NikeRunning Twitter feed as New Year’s resolutions kick off. Tailored tweets like this should be the norm for all companies. Twitter is a real time tool, a stream of constant information and in such an environment it is easy for tweets to get lost amongst the noise. Brands need to focus on adding value through real time interaction. Personalisation, engaging relevant content and timing are just three small steps brands should think about when using Twitter, all of which contribute to brand success.